The thesis is the first one in the country where it discussed arbitration with the mandate of reconciliation at all stages of the arbitration process. Researcher Hawamda mentioned the limits and controls of the arbitrator authorized reconciliation authority and this type’s specificity, what are the related problems to the arbitration process due to the lack of rules, comparing the three legislations; Palestinian, Jordanian and Egyptian, and the use of some legal texts. 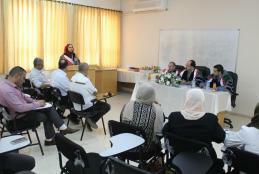 Researcher Majd Riad Assaf, commercial law student at the Arab American University Faculty of Graduate Studies, discussed her thesis on “Legal Regulation of Foreign Firms in Palestine: Study and Comparison”. In her thesis, she mentioned the regulations for foreign firms, compared the three legislations of Palestinian, Jordanian and Egyptian and she merely addressed some legal texts in Lebanon, Emirates and Qatar which deal with the existence of such firms in their countries. She concluded, for their sake all countries especially the developing ones, should have foreign companies within their lands to benefit from it; more manpower employment and advancement at all levels especially the economic and technological levels.